With the world of mobile gaming is undergoing a period of a big evolution, Gameloft continues to make games better and better. This is not the old time where we used to own a Nokia 1100 and play Snakes and getting entertained, HD games are not limited to PC or the Gaming consoles now. Mobile gaming is becoming an important money making and a good entertainment business for every developer. So here we are with more mobile gaming news. This time in our news we feature Gameloft which is one of the biggest mobile gaming developers. Gameloft is the owner of some of the best games for Android and iOS some of them include Dark Knight rises, 9mm, N.O.V.A. series and most importantly the Asphalt franchisee. The Asphalt franchisee was just renewed with a new version of the game Asphalt 7. The main problem that remains consistent with Gameloft is the release dates of games in different operating system. As we all know that whenever a game is developed Gameloft first releases it to the iOS, then after some days it is greeted for Android which is absolutely unfair for the Android users. Android is the fastest growing community in the mobile ecosystem, according to the current status one million Android devices are getting activated daily which is in itself mind blowing so Android users should not be left behind. Finally this has been understood by Gameloft and it has said that the company’s aim in this year is to release a game for both the platforms simultaneously. This is a complete matter of rejoice for the Android users as this is the fairest option if not the best. 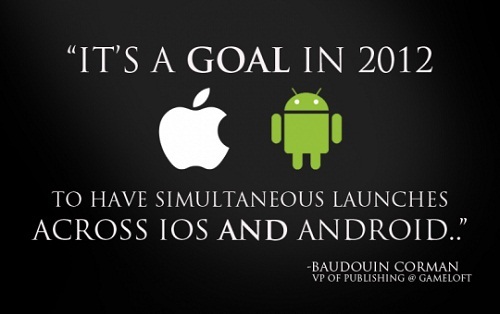 The company previously could not live up to the promise of releasing both Android and iOS versions simultaneously. We can only hope that the company lives up to its promises.